If only all parties involved some kind of helicopter-UFO appliance. Or at least melted cheese. 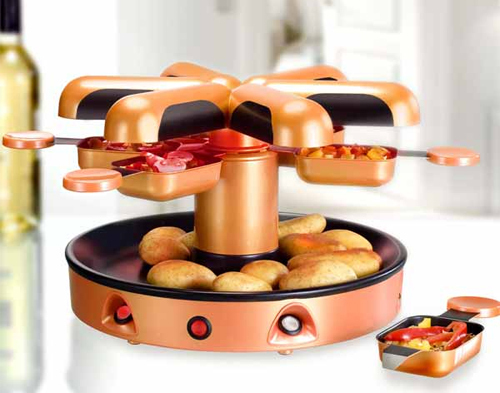 With the Unold Flying Raclette you get both! Made for melting or browning cheese, which is then served with potatoes, meat and vegetables, the sci-fi looking kitchen gadget is a new take on a traditional raclette grill. Okay, we have officially gone too far as a society. The line has been squirted in the sand: screen-printed squeeze bottles might just be the most unnecessary celebrity chef merchandising concept ever. First of all, who’s gonna see them? You’re in the kitchen, cooking for some guests. 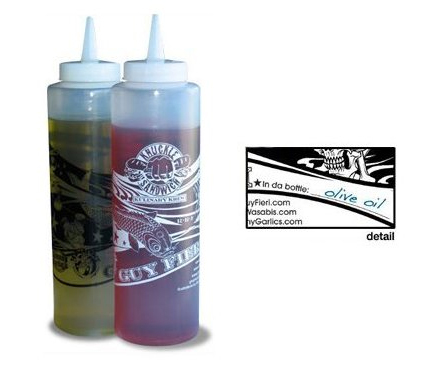 Do you turn to a friend and ask them to pass the Guy Fieri Squeeze Bottles? No, no you do not. Please, do not. You can’t blame Marketing for coming up with such a useless promotional item. After all, precedent has been set. We now live amongst Alton Brown Flags (not really) and Rachael Ray Sheets (really). The madness has to stop. Even if you do need a set of squeeze bottles, there are better options out there. Here, just get these and draw on all the cheesy dice, flame, and/or skull tattoos your heart desires. Burgers are always better when they are homemade. I think the same could probably be said for burger-themed house wares. 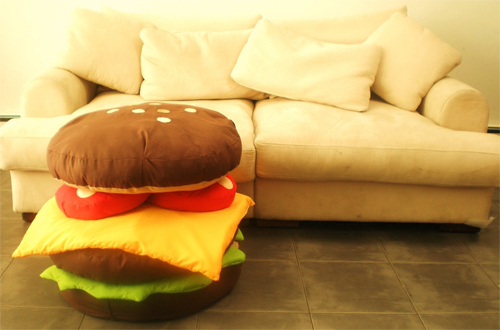 Personally, I can say that these Hamburger Scatter Cushions appear to be the best hamburger cushions I have ever seen. While I cannot attest to the taste, I can proudly say that I wouldn’t mind resting my head on that hamburger patty. While thankfully there does not appear to be any special sauce, I cannot help but wonder where the pickles got off to. Oh, perhaps they are just in another room with the onions. In any event, it’s the most comfortable looking burger I have ever seen. Cheese served with bread is a combination that has seemingly endless possibilities. Adding heat to the equation makes those possibilities truly endless. From the strong to the mild with bread to match, the taste combination afforded by this simple staple is both comforting and delicious. 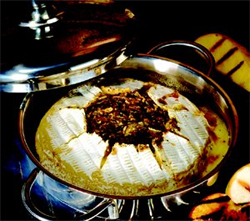 The Gourmet Village Brie Baker is a stainless-steel pan designed to be used directly on the grill. The 4.75-inch diameter baker can also be used in the oven. While ribs, burgers and chicken may be the star of your barbecue, adding a side of warm, melty cheese is sure to be a crowd pleaser. In fact, considering the possibilities, you may just want to pick up two of these handy little pans. Cheese graters come in many different shapes and sizes, but no matter which style you prefer it takes a certain nimbleness to navigate the end of a block of cheese. A shredded pile of deliciousness may be staring you in the face, but the question always remains what to do with the piece of cheese left in your hand. Too small to properly grasp, and too large to consider as shredded, more often than not, this little kitchen scrap gets nibbled on or thrown away. Sometimes to the dismay of our fingers, we throw caution to the wind, and try to shred out every last scrap of cheese in the block. No longer must cooks suffer the humility of grated knuckles simply to utilize the whole block of cheese. The Mario Batali Cheese Grater features an ingenious design that incorporates a cheese grip right into the handle. 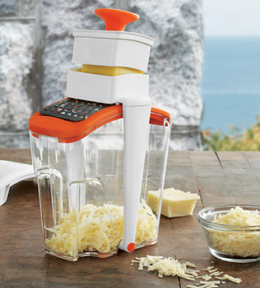 While shredding, simply press down on the cheese with the easy-to-grip handle, and your fingers will be protected. Cheese is delivered right into the measuring vessel, and there is even a lid so you can save any unused cheese. Saving fingers and cheese, Mario Batali might be the next superhero. Now if he can only figure out what to do with that pesky economy.